Have you noticed this strange reaction we all have when we have a strong emotion, or sensation? We close our eyes, to savor the moment till its last drop. There are many moments that make the life special: the first kiss, scoring a goal, riding a rollercoaster, dancing at the concert of favorite singer, or simply enjoying an iced Coca-Cola… No one wants to miss such moments because life would be a lot less exciting without them. In fact, when special moments come, we want to savor it 100% and this intense feeling makes us close our eyes. 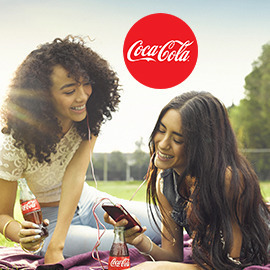 The very iconic brand Coca-Cola is looking for new ways to connect with teenagers from 14 to 18-year-old on a personal level. They want to be the companion for special moments and they launched a campaign “Eyes Closed”. Now, Coca-Cola is looking for ideas to bring the campaign to life, online and offline. Can you help?